I decided that since we were having such great weather I would take a trip to the coast. The plan was to leave at 9am and ride a 300 mile loop. The first half of the trip was fantastic, with lots of great views and areas I hadn't explored before. Unfortunately once I reached Newport I smelled gas. At first I figured it couldn't possibly be me... but alas, it was. I pulled into a gas station and made some phone calls. All of the details of the ordeal are documented here, in a full page writeup about the trip, including many more pictures and info of the problems I encountered. Long story short, it was the fuel injector pressure valve that busted open. I think I'll be ordering some metal ones from Team Triumph soon. My day trip turned into a two day trip as I had to stay at a hotel in Newport, awaiting parts in the morning. 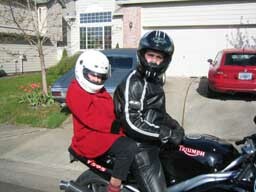 I got a call from the Triumph shop on Saturday while I was at PIR that my bike was done. I went to pick it up today. I talked to the mechanic and he told me that the cause for the problem was that the hose connected to the fuel pump had blown itself off. He said that this a known problem that happens to these bikes because Triumph put the wrong clamp on the hose when they built the bikes! Damn Brits. 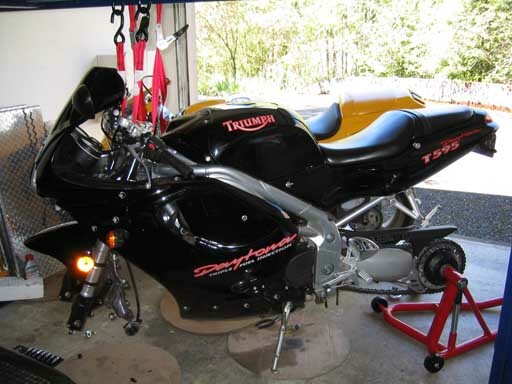 He said that even though my bike is 5 years out of warranty they'll submit the claim to Triumph since its a known problem and they may actually pay for it. He says it has been done before. I doubt it, though. He also replaced the fuel filter while he had everything apart. He said he found all kinds of interesting things in the tank, as well... The bike was a theft recovery, and he said inside the tank was all the parts to the lock from the gas tank when they busted it open. Besides that he found a cork (like from a wine bottle, he said), and some pieces of card board. I think there was one other thing, but I forget what it was. I wish he had taken a picture of it. Oh well, that's what I get for buying a theft recovery! 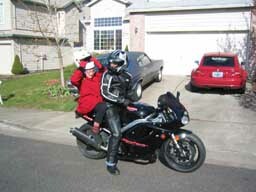 I went for a quick little ride today to check out a condo that I'm interested in. Afterwards, my 95 year old grandmother told me that she wanted to go pop some wheelies, so I said, "sure!" "Grandmommie" felt great once on the bike! 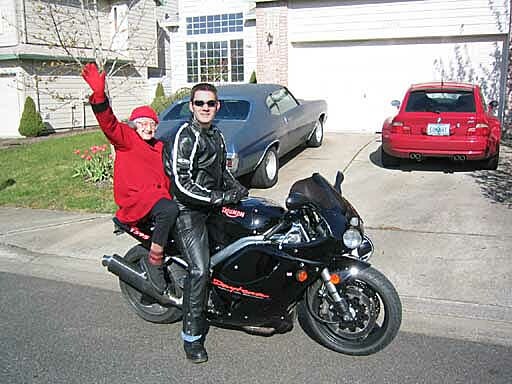 After some fantastic, monster wheelies, Grandmommie (who's 95, if you'll recall) said that she wanted to go blasting through the twists in the hills. 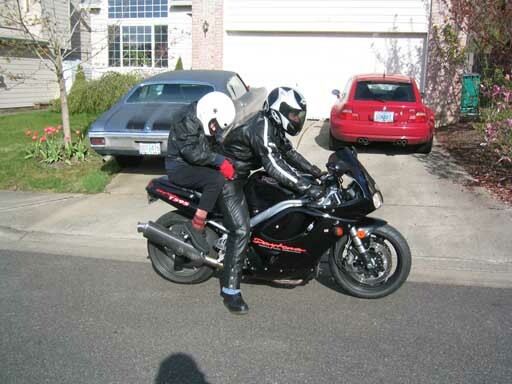 For this, we headed back to the house, took her grandmommie coat off, and put on some leathers. NOW she's ready to race! Afterwards Grandmommie said she had an absolute blast! Hmm... actually, to be honest with you, the whole talk about riding never really happened... However, the fact that my 95 year old grandmother even wanted to (and is still able to), get on the back of a sport bike is pretty cool, if you ask me. She said she would have liked to go around the block, but I wouldn't have felt comfortable giving her a ride (she couldn't even wrap her arms around me). However, once I started it up and revved it a bit with her on, it freaked her out well enough that she no longer wanted to go for a ride. :-) Ahhh... the Triple sounds good even to 95 year old women! It worked surprisingly well. What a deal. Off came the wheels, and the bike was left dangling in the garage while we took off to Cycle Gear. While at Cycle Gear, I also picked up a Dainese Back Space 2 back protector. I tried on about 6 of them and the only two comfortable ones were the Back Space 2, and the Dainese BAP 2. Since the back space was thinner, I decided to get it. Surprisingly, it was $159, which was less than I found it for online. What a deal. Once we got back to the house we put the wheels back on, this time in just 5 minutes per axle, and lowered it from the lift. I then noticed the huge gouge in the black paint of the front wheel that must have occurred during mounting. Unbelievable. Aside from that, the new tires looked great on the bike. The rear is certainly a steeper curve. 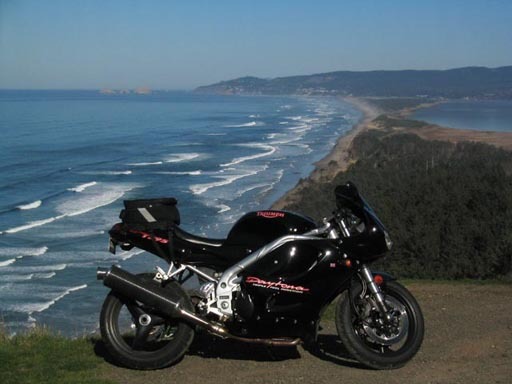 I then left and went on a 60 mile ride (first time with the back protector too). Instantly I noticed the bike seemed much more willing to turn. Very nice. Once I got into the hills I was amazed how much smaller and maneuverable my bike felt with the new tires! I'd push lightly on the handle bar and it flipped right over. 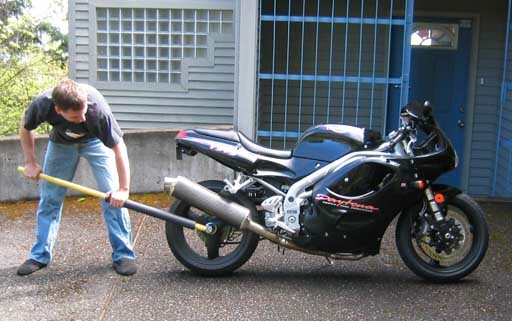 I use to have to fight with the bike to get it to work with me. 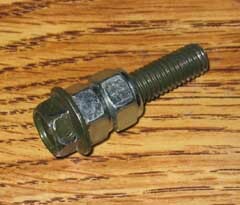 It also seemed quite a bit more predictable; that warn flat rear tire was really screwing with my handling. I'm still in the "scrub in" time of the tires, but I can already tell I'm going to love these things. The back protector is going to take some adjustments; it was scooting up and digging into my neck. I probably just had the shoulder straps too tight. Once I got home I loosened them and it seems to fit much nicer now (molding to the shape of my back). I'll see on future rides.